Drug-Resistant Malaria On The Rise In Southeast Asia : Shots - Health News Southeast Asia has been a hot spot for drug-resistant malaria in the past. Now researchers in Thailand worry that a superstrain resistant to the last, best malaria treatments could undermine progress made against the mosquito-borne disease. 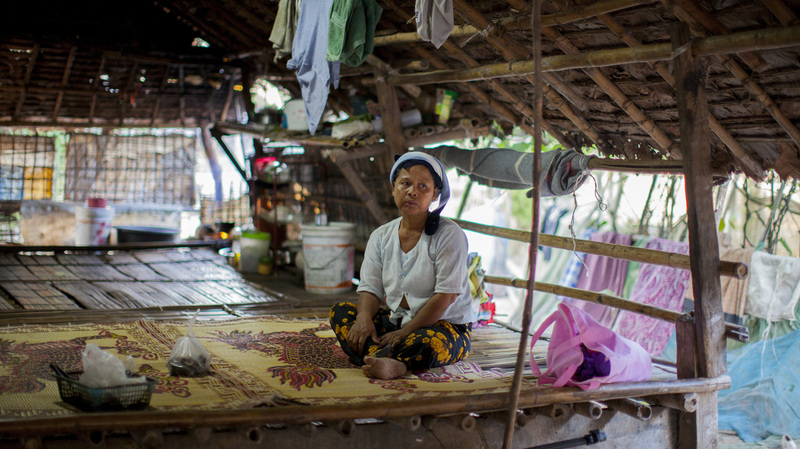 Daw Khin Twon, an undocumented immigrant from Burma, rests at home after receiving malaria treatment at the Mae Tao Clinic in Mae Sot, Thailand. For malaria in Southeast Asia, there's good news and bad news right now. Overall, the number of cases is down, but there's a growing problem of drug resistance in the cases that do crop up. Researchers worry that superstrains of the parasite — strains immune to the most common medications — could wipe out the recent progress against malaria. Even more worrisome is the prospect that that drug resistance could spread to India and eventually to Africa. And on this front, history isn't very comforting. In the past Southeast Asia has been a hot spot for malaria drug resistance. "Resistance to chloroquine and pyrimethamine started here," says Arjen Dondorp, who directs malaria research at the Mahidol-Oxford Tropical Medicine Research Unit in Bangkok. "Those two were very important drugs until recently. Very cheap, good drugs. We've lost them to resistance, especially here in the region. And then it has spread from here to the rest of the world." The current resistance is developing to artemisinin-based drugs — the last, best treatments we have to stop malaria. When this family of medicines first came on the market, they appeared to be wonder drugs. Over the last decade, they have proven incredibly effective at treating malaria around the world. Global deaths from the mosquito-borne disease have fallen from roughly a million a year in 2000 to 650,000 in 2010. Simultaneously, the number of malaria cases has dropped, and these gains are attributed mainly to the use artemisinin. Dondorp says if the artemisinin drugs start to fail on a large scale, it could be a major setback for malaria control efforts globally. "Chloroquine resistance was very bad in the '90s before the artemisinin drugs were introduced and has caused millions of deaths in Africa," he says. "So the big fear is that the same could happen with artemisinins." The resistance currently is being found on both sides of Thailand's border with Myanmar in the west and Cambodia in the east. There have also been reports of malaria drug resistance in Vietnam.